How did Kevin O’Connor help create DoubleClick, the innovative marketing technology company...two software companies...dozens of products...and now the “disappearing” DVD, a product that will turn the home video market on its head? Sheer brilliance? While O’Connor is very smart indeed, he credits his success to applying Thomas Edison’s famous saying that “genius is one percent inspiration and ninety-nine percent perspiration.” In other words, the breakthrough product or service that is the result of sheer genius alone is the exception. Great ideas that form the basis of new companies or that can make a hero of someone toiling in the corporate world are within reach of us all. “But wait,” says O’Connor, “ideas are cheap.” Just as important is doing something with them—a process that will turn the best ideas into something that people need. 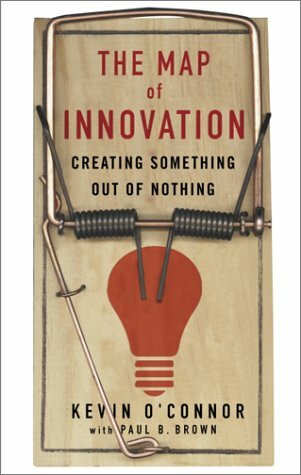 In other words, O’Connor argues convincingly, innovation can be systematically forced. The Map of Innovation is O’Connor’s step-by-step approach to devising lucrative new products and services and bringing them to market, through a process that has proven itself time and again in many different industries. Too often, people trying to innovate focus on things that don’t matter or waste their time trying to find answers to questions that can’t be answered. O’Connor shows why the map of innovation centers on getting right the five make-or-break fundamentals: creating a large number of viable ideas; picking the right idea to pursue; creating a highly focused strategy to bring the idea to market; getting the money to fund the strategy; and hiring the best people. With Kevin O’Connor, the proof of the value of methodical innovation is in the pudding. He helped start companies that have employed thousands of people and created billions in shareholder value. Anyone can get lucky once, but for success to strike three times and to include many successful products, there has to be a method and map, and any company, big or small, working on any product or service can benefit from O’Connor’s time-tested tactics.